The holidays are so much more than a single day. 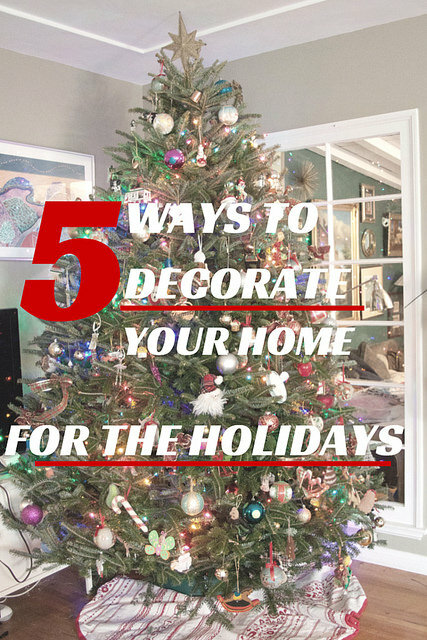 They’re an excuse for gatherings of friends and family, shared stories, and shared meals. 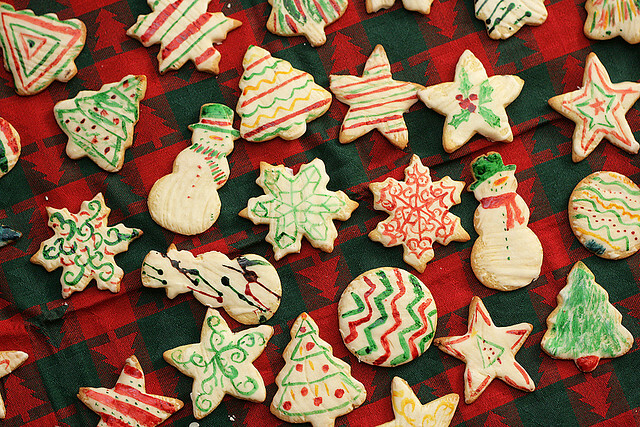 A cook during the holidays is always looking for recipes to feed a crowd — for dinners, buffets, lunches, brunches, cocktail parties. Turkey is an obvious choice, roast beef a luxe one, but another great (and economical) dish that will feed a crowd with a lot of payoff for a little effort is a baked ham. Farmer John is a name practically synonymous with hams, but what I didn’t know is that they are based right here in Los Angeles, and have been for 80 years. I love supporting local businesses and industry — one of the things I love about living in Los Angeles is how economically diverse the region is. Furthermore, Farmer John really emphasizes their local ties and origins. When they approached me to develop a recipe using Farmer John ham and local ingredients, I was happy to work with them. The local inspiration for this ham recipe was right outside my window. We have a pomegranate tree outside our dining room, beloved by birds and squirrels. I grew up with pomegranates — my grandmother has a tree in her yard, and pomegranates are a regular feature of fall tables here in Southern California. 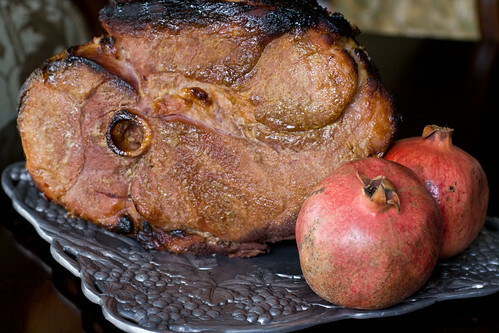 I thought the sweet tart flavors of pomegranate would be a wonderful complement to a salty, smoky ham. Baking the ham takes no preparation time at all, but a long, slow cooking time, so plan this for a rainy weekend when you’re home (and yes, it does rain even in Los Angeles!). I roughly chopped some aromatics — celery, onions and fresh gingerrot, set the bone in ham on top of them, then poured pomegranate juice (you can also use a combination of pomegranate and orange juice) over the ham and vegetables. Then you tightly cover the whole thing with foil, and bake in a low oven for a long time. After it’s baked for a while, mix up a glaze with pomegranate molasses, mustard and a little sugar. Pomegranate molasses is a classic middle eastern condiment that’s easy to find here in L.A. I’ve found it at Whole Foods or any Middle Eastern or Persian market. If you can’t find pomegranate molasses, you can make it from pomegranate juice, which has become widely available. 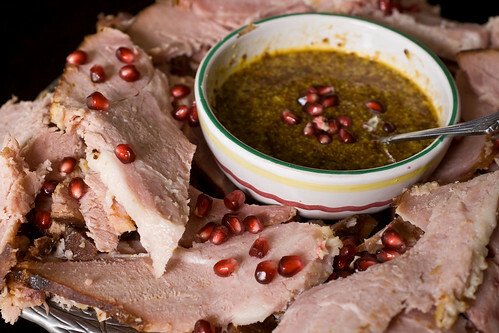 The pomegranate molasses has a fruity, sweet and sour flavor that is delicious with the ham. Brush the ham with the glaze, and bake, uncovered, at a slightly higher temperature, for another hour. The sugars in the glaze will burnish the ham to a deep mahogany. The ham can be served warm, or baked a day or two in advance of serving and refrigerated. 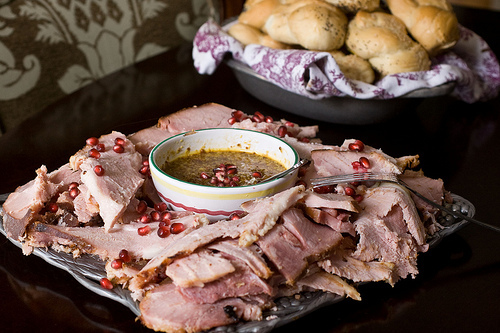 To serve this, I sliced the ham, created a sweet mustard with grainy mustard and more of the pomegranate molasses, and served with a basket of rolls to make sandwiches. If you’d like to recreate this dish (or another dish using Farmer John’s products), Farmer John has provided me with five $25 gift certificates for hams. This will buy you more than one ham. To enter, leave a comment to this post by 11:59 pm on Saturday, November 19. One entry per person. This giveaway is open to US residents only, and Farmer John products are available in California, Nevada, Arizona and Hawaii. Please see My Giveaway Terms and Conditions for the rules of this contest. THE GIVEAWAY IS NOW CLOSED AND WINNERS HAVE BEEN NOTIFIED. Disclosure: I was compensated to develop the recipe and write this post, but the words and opinions are my own. 1 Farmer John brand bone-in half ham, 9-12 lbs. In a large baking dish, arrange the chopped onion, celery and ginger. Set the ham atop the ginger, fat side up, and score the fat in a diamond pattern. Pour the juices over the ham. Cover the whole contraption with foil, place in the oven, and bake for about 3 hours, or 20 minutes per pound. After 3 hours, remove the ham from the oven and turn up the oven temperature to 350 degrees. Remove the foil, and brush the ham with the glaze. Return the ham to the oven, and bake for approximately 1 hour, or until the glaze is caramel brown. To serve: slice the ham thinly. Mix the mustard and the pomegranate molasses, and serve together. For me, it is not Christmas morning without Farmer John’s sausage links, so they do have a special place in my heart. Also, glad to have a good glaze recipe, as I like to make ham but dislike using packaged glaze mixes. Pomegranate molasses! Never heard of it and am intrigued. Great giveaway – I live in CA so I would love to try some of their meat! Nice. My kids are both pom-fanatics, and I love inventing (or trying) new ham glazes. So easy to make a good ham taste amazing. I’ll hit up Whole Foods this weekend. I could bathe in pomegranate molasses. I love the combo of it with mustard and ham. Sounds divine! 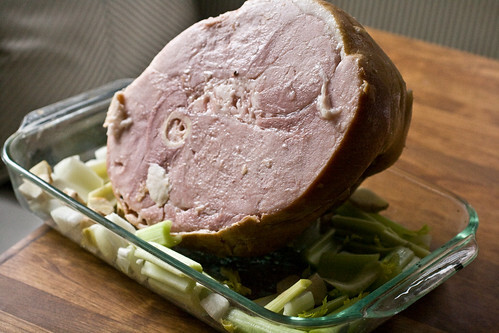 The ham looks great… I look forward to trying the glaze. Delicious. Can’t wait to try out this recipe. I was fortunate to be raised in CalIfornia a nd with Farmer John products. I have used the sausage in my Turkey stuffing for many years . Now that I live in Hawaii I am thrilled I can still use Farmer John’s yummy products! 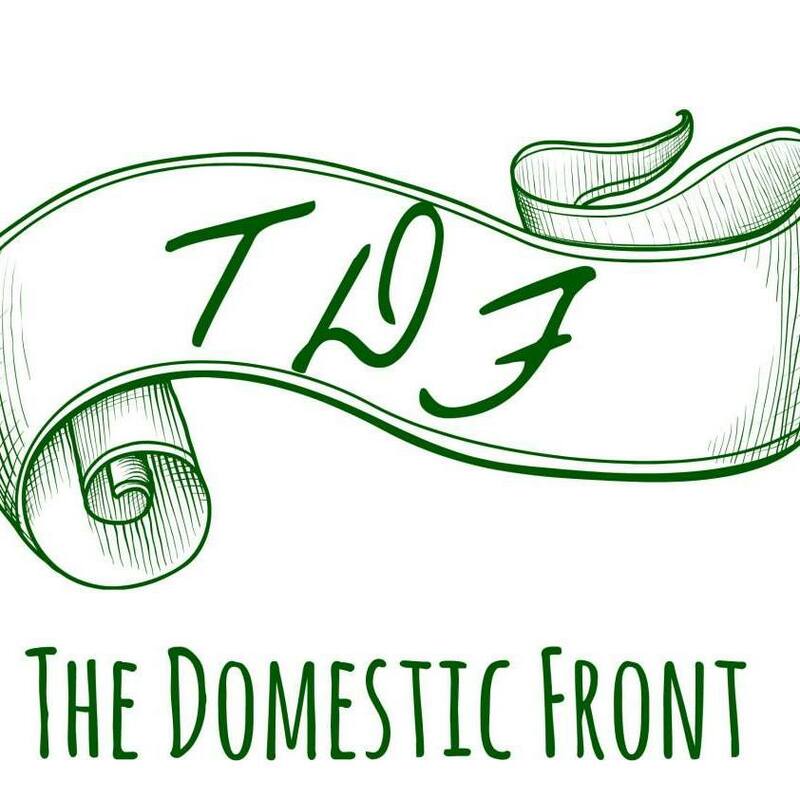 I’ve never heard of this brand–I’d love to try it! The recipe sounds delicious. I love ALL Farmer John products ! Bring on the pork ! Sounds super tasty, looks even better, gonna have to give that recie a try this thanksgiving!!! pomegranates are the best! I like to use sausage in my stuffing also. I have never heard of Farmer John’s before but it looks good! I would definitely love to try to make this beautiful mouth watering Farmer John ham n all its ingredients. If it comes out the way it looks on the puctures my family will ask me to make this every holiday.